The Drikung Kagyu Lineage is one of the Kagyu lineages which was founded 852 years ago, by the great spiritual master, Jigten Sumgon. This lineage directly came from Buddha Shakyamuni and the primordial Buddha, Vajradhara. All their precious Dharma teachings came to Gampopa from three lineages, through fully enlightened masters. The first lineage was called the "Magnificent Blessing Realization" lineage. 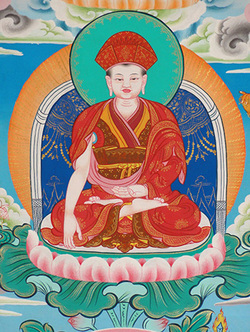 From Vajradhara, it was passed on to Tilopa, from Tilopa to Naropa, from Naropa to Marpa, from Marpa to Milarepa, and then from Milarepa to Gampopa. The second lineage was called the lineage of "Profound View." It came from Buddha Shakyamuni, and it was passed to Nagarjuna, then to Chanta Kirti and so forth, on to Atisha, and then from Atisha to Gampopa. The third lineage was called the lineage of the "Most Excellent Practice." It came from Buddha Shakyamuni to Manjushri, from Manjushri to Maitreya, from Maitreya to Asanga and so forth, on to Atisha, and then from Atisha to Gampopa. Gampopa received profound teachings, secret oral transmissions, blessings, and so forth of all these three lineages. Then all these teachings were given to Phagmodrupa by Gampopa. Although Kagyu came from the same root, at that time the Kagyu lineage was divided into several different branches, each carrying the complete teachings and enlightened blessings. Like the wish-fulfilling tree, which comes from the same root, but is divided into different branches, each giving many wonderful blossoms and fruits.